Wool bricks are 37 percent stronger than regular bricks, researchers say. You’ve got more wool, clay and seaweed than you know what to do with. Here’s a solution: Make really strong bricks. Researchers in Spain and Scotland say they’ve done just that. 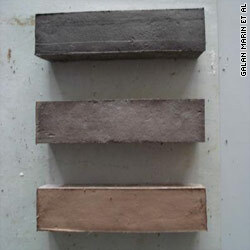 In experiments conducted at the University of Seville in Spain and the University of Strathclyde in Glasgow, Scotland, researchers added wool fibers to the claylike soil used to make bricks, then threw in alginate conglomerate, a polymer made from seaweed, according to a study published in the journal Construction and Building Materials. The bricks with wool were 37 percent stronger than conventional bricks and were more resistant to cracks and fissure, the researchers reported. Wool bricks are also energy savers as they’re made without firing, they said. The bricks aren’t going to force anyone to give up their kilts or sweaters. Scotland’s sheep farmers produce more wool than its textile industry can use, the researchers say. The key finding is this... "The mechanical tests carried out showed the compound to be 37% stronger than other bricks made using unfired stabilised earth." Sorry CNN, close, but no banana on the facts there. I'm all for eco-friendly bricks such as these. But there are issues getting them approved for use in buildings. Many brick and concrete block manufacturer's have extensive testing for their products, not to mention a performance history. These bricks do not have that. Then there's also the ASTM specifications these bricks would have to meet. This happened to bricks made primarily out of Fly Ash (a by-product from burning coal). It's a great way to turn a waste product into something useful vs. being put in a landfill. But because the testing and history wasn't available, not many people are going to want to use such a product. As for adding fibers to concrete blocks. It increases the flexural strength of these blocks. There can be an increase in compressive strength though. But the issue is just being able to extrude a fibered material without encountering production issues. Fibers typically equate to clogging.